Work on downtown infrastructure continues along Newberry St and Park Ave, SW moving toward Hayne Ave. 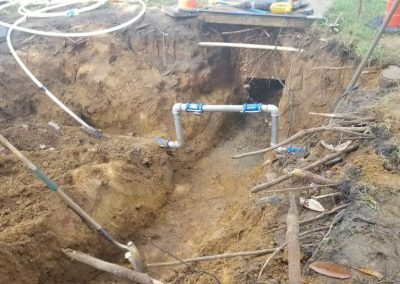 It is anticipated that work will continue for the next 2 weeks as crews install water and storm sewer lines. Watch for any lane closure signs. 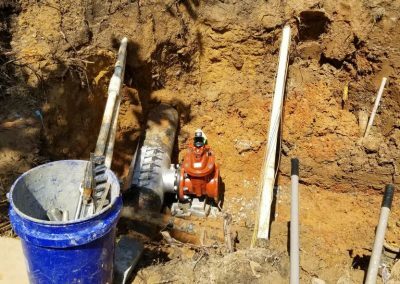 Work should not interfere with customer’s existing water service during this process. Park Ave STA. 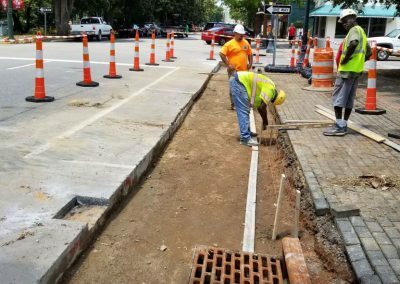 16+30 – Installation of 15” RCP storm sewer (06/28/2018). Park Ave STA. 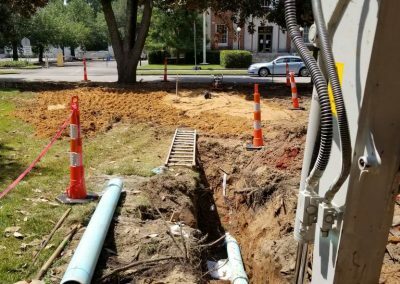 16+30 – Relocation of existing 2” water main for installation of new storm sewer (06/26/2018). Park Ave STA. 16+50 – Level and forms set for curb over 15” storm sewer and flowable fill. Storm Structure I-43 (bottom) (07/23/18). Park Ave STA. 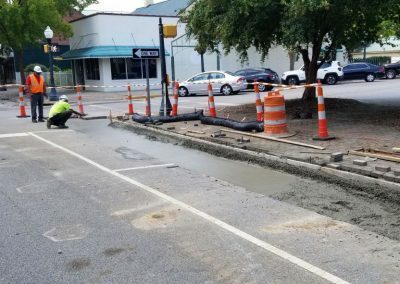 16+50 – Concrete subbase poured, and curb hand formed (07/24/18). Park Ave STA. 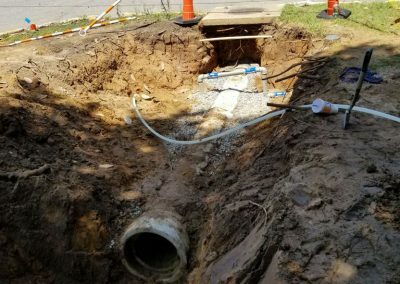 13+50 – 10”x6” TS&V installed for DO #1 (07/24/18). Park Ave STA. 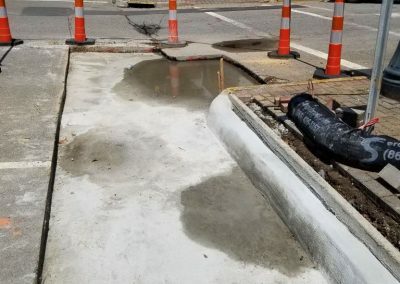 16+60 – Concrete subbase and curb over storm sewer. 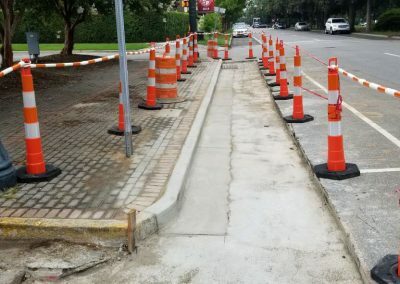 Curb shown to be removed and replaced (07/26/18). Park Ave STA. 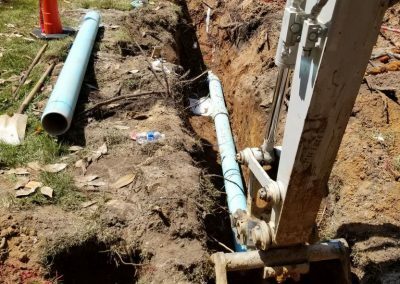 13+50 – Backfilled area over 6” PVC. Wet material from previous rain spread to dry (07/27/18). Park Ave STA. 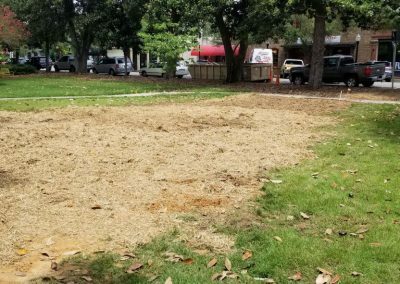 13+50 – Temporary grass and mulch on disturbed area for water main installation (07/31/18). Park Ave STA. 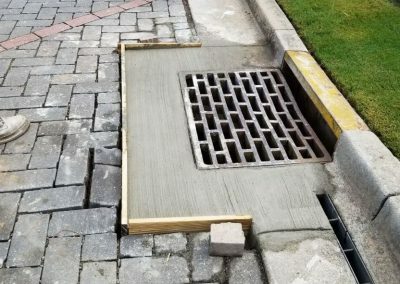 16+50 – Concrete cap and curb & gutter (repaired). Storm Structure I-43 (top) (07/31/18). Newberry St. STA. 18+83 – Existing I-97 concrete apron poured. Bricks to be leveled once concrete cures (08/01/2018). Park Ave STA. 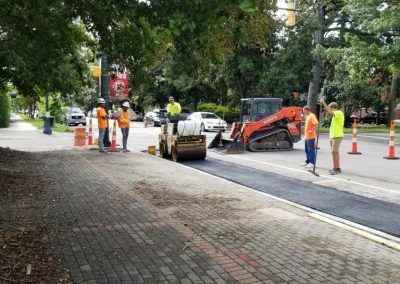 16+60 – Asphalt overlay rolled into place over concrete cap of previously installed storm serwer (08/01/2018.